Lewis Hamilton after taking the pole position was able to complement it, with winning the race after a very competitive display with Sebastian Vettel in Barcelona reducing the Championship points to six points, in five rounds. Hamilton started at pole position but his starting was slow, which caused his early trail behind Sebastian Vettel while Valtteri Bottas, Kimi Raikkonen and Max Verstappen followed behind as they went through the first turn. Kimi Raikkonen and Max Verstappen ended their race very early, due to a collision which was caused by Raikkonen's attempt to go round Bottas but instead got tapped by Bottas, ending that episode with Raikkonen spearing into Verstappen. Also at the second and third turns, Felipe Massa collided with Fernando Alonso, forcing the McLaren into the gravel and both also couldn't continue the race. holding a six second lead just a few laps earlier, Vettel exited the pits level with Hamilton as the Mercedes charged down to Turn 1. The two went side by side into the corner, touching wheels and forcing Hamilton off the track on the exit. 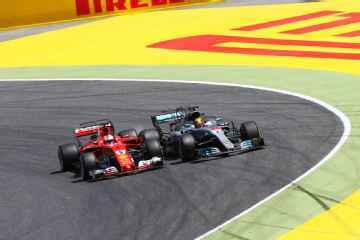 Hamilton radioed his team to hinting Vettel as "dangerous", but with the two cars on different tyre compounds the race was so far from over. Vettel managed to block the inside line into Turn 1 for six more laps, but Hamilton's tyre advantage ultimately proved too difficult to defend against on lap 44. Having nailed the exit of the final corner on the previous lap, Hamilton cruised up behind the Ferrari in his highest engine mode and, with the DRS open, was able to pass around the outside into Turn 1. 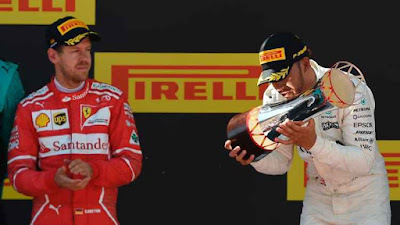 Hamilton was worried his aging soft tyres would cause him issues in the final few laps, but as he crossed the line he held a 3.5s lead over Vettel in second and had successfully cut the gap to just six points in the championship.